Action was a separate ‘thing’. Action usually happened towards the end or after the unit. Action needed to be visible. Action was only about what students ‘did’. Action needed to go beyond the self in order to be valuable. Student initiated action was the most desirable kind. If learning is active, relevant and meaningful, action will be integral. Learner agency implies ongoing action of all kinds. Some of the most valuable forms of action are not overtly visible – shifts in thinking, deepening feelings, development of dispositions. Action might be shifts in what learners think, say, feel, have, believe and become… not just what they do. Action often begins with shifts in the self. Shifts in thinking can lead to visible action. Action can lead to shifts in thinking. Demonstrating attitudes and skills can be a form of action. Sometimes an idea isn’t initiated by students, but they can take it and run with it resulting in highly meaningful action. Do you consider these to be examples of action? Try placing them on an iceberg, depending on whether they are overtly visible or not and see what new ideas emerge? The PYP review update suggests the following lenses through which to view the demonstration of action: social justice, advocacy, participation, lifestyle choices and entrepreneurship. 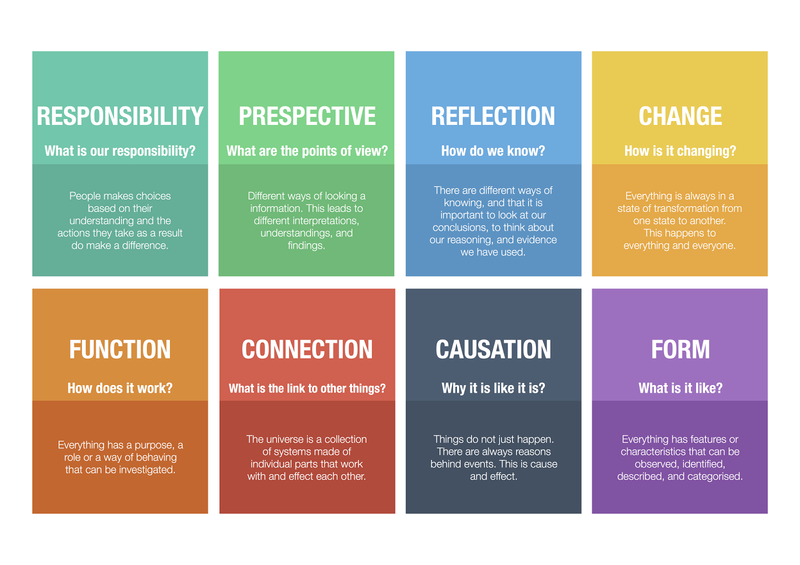 We have applied the model of action below (shifts in thinking, having, saying, feeling, being as well as doing) to unpack what each of the new lenses might look like… in action. When viewed in this way, it becomes apparent that concepts like social justice can apply just as much to 5 year olds as to older students and that any one of the lenses can be just as relevant in the classroom context, the school, the local community or globally. What action will you be taking next? Whether your students are completing assignments, inquiring into areas of their interest, covering curriculum or exploring their passions, to what extent does it feel (to you, as much as to them) as if they are simply complying and ‘doing school’? 1. Do you LISTEN more than you talk? 2. Are the learners really inquiring, in the broadest sense of the word? 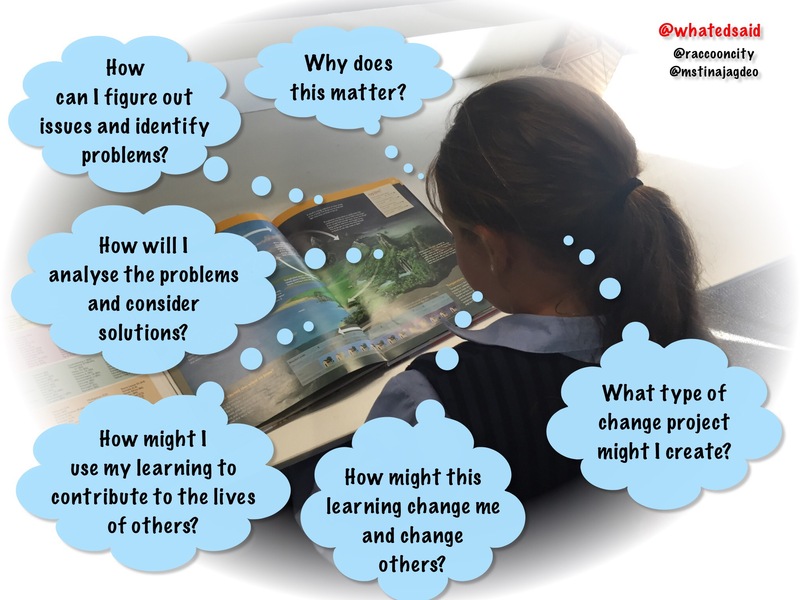 Look at the description of inquiry from Making the PYP Happen. Are they doing most of these things? Or just researching? 3. Will this inquiry be worthwhile? Will the learners experience challenges and figure out how to overcome them? Support them in feeling comfortable in the ‘learning pit’? 4. Is the inquiry concept driven? Are the learners doing more than just finding facts and information? Are they exploring and developing an understanding of big conceptual ideas. Are they looking through the lens of one or more key concepts? Can they identify big ideas and apply them in other contexts? Can they articulate conceptual understandings developed along the way? 5. Do the learners have ownership? Will this inquiry help them grow, not just in knowledge of content, but as learners? 6. Are the learners thinking critically and creatively about the content they explore? 7. Are the learners able to think about how their inquiries impact on other people? Will they be motivated to take action? 8. Will they explore ways of extending the learning beyond the classroom? Look for opportunities for collaboration across the year level. Encourage interactions with primary sources within and outside outside of school. Use your network and theirs to help extend the learning to the broader community and the world. 9. Will there be opportunities to identify problems and issues and develop solutions? 10. Will learners have opportunities to express their learning meaningfully and creatively? How will learners present, represent and/or share their learning? Will they choose to express their learning through a creative medium such as art or film? Will they paint or sculpt? Will they write poetry? Set it to music? Do an expressive dance? Create a stop motion animation? Build a model? Develop an app? Design a website? Write a book? Organise a debate? Start a blog? Make a speech? Create a campaign? Lead a workshop? Will they do, say, think, feel, want… or be something different as a result of this learning?